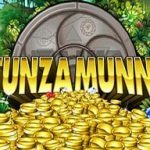 Tunzamunni is a video slot game from Micorgaming with an interesting name. We cannot say what the meaning of this game is but we are guessing that this is just another word for money. That judgment is made from looking at the symbols, they are classic 7s and BARs but the sparkling and the gold suggest that it is all about riches. This is a classic game with 3 reels and 1 pay line. What makes this game stand out in the crowd is the progressive jackpot that it has to offer. Since Tunzamunni is a classic slot that means it lacks in special symbols and features. So why this game is still popular besides the fact that is very old is the huge progressive jackpot that it offers. The only trick to win the gigantic prize is to place maximum bets. The amount that is above the reels will slowly increase with every single spin you make and if you manage to land the right symbols it will be yours. You need to land 3 sevens in the following order, on the first reel you need silver 7, on the second reel you need red 7 and on the third reel you need blue 7 symbol. Tunzamunni is a very appealing game from Microgaming. The fact that this game offers a progressive jackpot makes this slot appealing and passes the test of time. There are no other special features but that is with purpose, so you can focus on the big prize only. If you have not played this game so far we advise you to do it and maybe you will be the lucky winner. For all of you fans of Ancient Egypt you should consider playing Treasure Nile a 5 reel slot by MicroGaming.